Holy flavor, Batman. 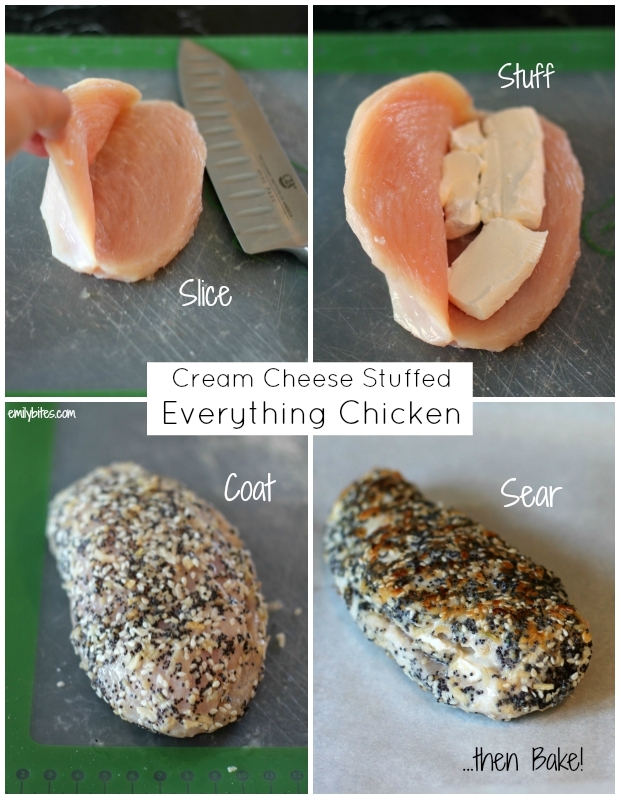 This Cream Cheese Stuffed Everything Chicken is anything but your standard boring chicken breast. 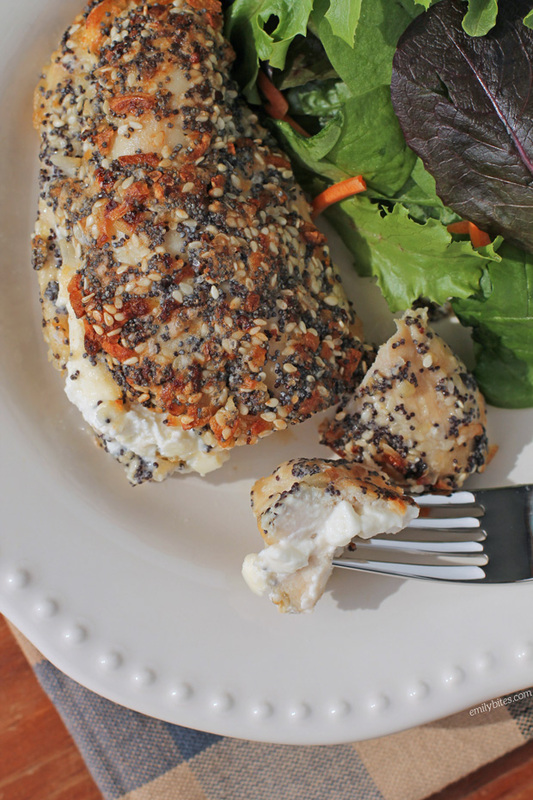 These breasts are overflowing with smooth, rich cream cheese and coated with a crust of garlic, onions, sea salt, toasted sesame and poppy seeds. It’s all the flavors you love from an everything bagel, but as a low carb, high protein chicken dish you’ll want to make again and again. 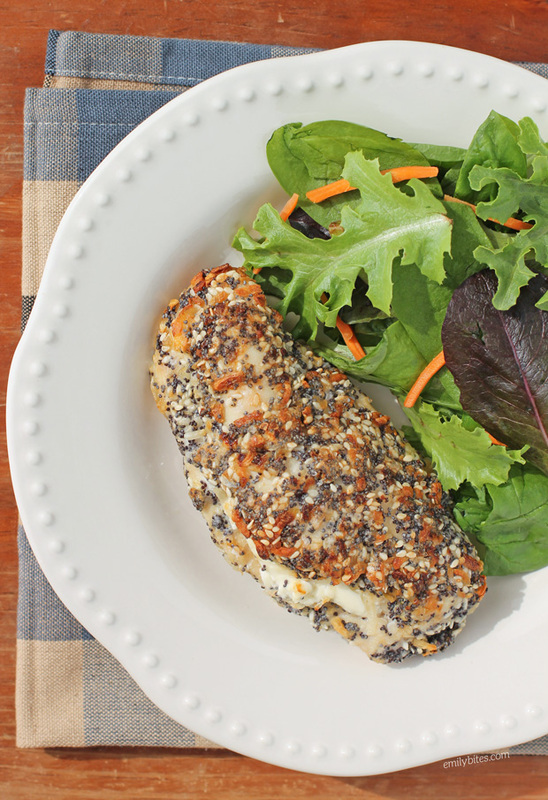 These Cream Cheese Stuffed Everything Chicken breasts come together really easily and pretty quickly, so they’re a perfect weeknight meal. You can also easily double or triple the recipe to serve your whole family. The chicken goes great with a side of roasted veggies, a salad, some cheesy broccoli or some wild rice. The possibilities are endless and a serving is only 333 calories or 5 Weight Watchers SmartPoints! Looking for more ways to make your chicken breasts delicious? Try my Cheesy Bacon BBQ Chicken, Pesto Chicken Roulades, Lemon Pepper Iced Tea Chicken, Cheesy Chicken and Stuffing, Pizza Chicken Roulades, Thai Chicken Skewers, Chicken Piccata, Slow Cooker Buffalo Chicken and many, many more in the chicken section of my recipe index! Place the chicken breasts on a cutting board. Using a sharp knife, slice the breasts from the side (creating a top and bottom) almost all the way through. Open each breast at the slit and place 1 oz cream cheese inside. Spread cheese across the surface and close the breast, folding the top half back over the cream cheese. Place the stuffed breasts in a Ziploc bag and add the flour. Lightly flip the bag around until chicken is coated with flour. Place the beaten egg white in a shallow dish. In a second shallow dish, mix the sesame seeds, poppy seeds, dried onion, salt and garlic. Remove each rolled breast from the flour bag and dip it in the egg white, turning to coat. Then move the coated breast to the dish of seed mixture and coat it on all sides. In a small skillet, add the oil and bring over medium-high heat. Add the stuffed and coated chicken breasts to the pan and cook for about 1 minute until the seeds on the bottom are golden. Flip the breasts and cook for another minute on the other side. Transfer the breasts to the prepared baking sheet and place in the pre-heated oven. Bake for 30-35 minutes until chicken is fully cooked through. My husband loves the everything bagels! Definitely going to have to try this. I hope you both love it! made this tonight– was great! will make again! Your chicken recipes are always the greatest, and I’ve made most of them. They were all very delicious, and worthy to serve to company…. since they also have ‘eye-appeal’. I’ll defiantly make this chicken as soon as I purchase some more poppy seeds. I’m sure we’ll love it. Thanks Emily! This looks amazing!! I love everything bagels. Definately on dinner menu this week!! This looks fantastic! Can’t wait to try it! For the minced garlic — do you use fresh or dried? Making this tomorrow for my friends birthday dinner. Can’t wait to try it!! This recipe is really great! It turned out perfectly, great step-by-step instructions and it tastes as good as it looks in Emily’s photos. Mine looked a bit messier! But it was a big hit in my house. I’ve already made it twice. Thanks Emily! Made this yesterday. Mom wasn’t interested. Today she took some for lunch and texted me how good it was! Yum. I started weight watchers last week and I made this tonight for dinner and I am obsessed! I have been telling everyone about it ! Loving your website! Pinning a ton! Thanks for the great recipes! Absolutely love this recipe! I was a little skeptical about the combination of cream cheese and chicken, but the end result was fantastic. My whole family loved it! Made this tonight and it was oh so tasty! My family loved how tender the chicken was! After I seared the chicken, I covered it with foil to bake. They were thinner chicken breasts so 20 minutes did the trick, and they stayed really tender. The only thing I will do differently next time is mix the everything toppings in small batches for each piece of chicken. Thanks for this awesome recipe. Definitely putting this one in the rotation! We are gluten free. I’m going to try this with cornstarch instead of the flour. I made this tonight. I substituted the cream cheese with the spreadable cream cheese that has green onions in it. It was delicious. I got rave reviews from my daughter and even my picky granddaughter. Thanks so much for the wonderful recipe. So so so good!!! I will add this to my fave list!! ..the only thing I would do next time is ..pound out the chicken a little my breasts were big and after cooking a little tough….but it was so good..thanks for all your recipes I just love them! I made this for the first time last Monday and we’ve already had it twice. We LOVE this recipe in our house! I will say that it was a little too onion-y for me so the next time we made it I decreased the amount of onion on my piece of chicken (and put the extra on my fiance’s) and it was perfect. Definitely keeping this one in our house! Making this tonight…and so disappointed that all the lovely coating got stuck on my cast iron skillet during the browning/toasting phase. Boo. I oiled the pan before, but maybe this is best done in a non-stick pan next time. It’s out of the oven now, cooked nicely, tastes good but looks awful without the coating! Made this for dinner tonight, with a Weight Watcher’s Zucchini Casserole and a side of noodles, it was delicious. My husband loved it. Will be making this again!! I just made this tonight and it was fantastic!! Easy to make and my Hubby loved it!! So did I! Next time I’m going to try it on the kids, I’m sure it will be a regular dinner in our house! Thanks for sharing! Do the poppy seeds make or break this? It’s the only thing I don’t have on hand but will run to the store if its absolutely needed. Thanks! This was very good. I did it without the poppy or sesame seeds, as I couldn’t find them in the crowded grocery store. But, I will def try it with them next time. Love, love loved this recipe. I didn’t have the dried onions so I used french fried onions instead. This recipe was declared a keeper by my husband and son. Can these be made ahead and frozen? If so, how far do I go and prepare it before freezing? Thank you!!! Do you think these would be Grill-able? Hm. I’m honestly not sure because I’ve never tried it. I’d be a little concerned about the coating getting lost? If you try it, definitely report back! I made this for the second time tonight and it it sooooo GOOD!! And so easy! I used the chicken cutlets, as I prefer thinner chicken, and just stuffed them and folded over in half. Just reduced the time by a few minutes and they came out delicious! Definitely a keeper! My husband made this for dinner last night and it was faaaaaaantastic! Our three boys loved it! This is one of my favorite recipes! I’ve made it several times and most recently last week I made it for my sister and her husband and they both loved it too! I don’t think I’ve tried one of your recipes that I haven’t liked yet, they’re all really great! I also love that you have the Weight Watchers Smart Points already figured out, it’s very helpful! I’ll be making this one again. The only thing I’ll do differently was also mentioned in a previous comment. Next time I’ll divide the coating into separate portions for each side of the chicken before I dip them. After dipping in the egg almost all of my coating stuck on the first side of the first piece of chicken I dipped. I had to kind of scrape it off and smooth it back around. But the flavor was spot on! Thanks Emily! Loved this chicken! Only problem I ran into was the first chicken breast took up all the seed mixture and I had to go back and make more for the second breast. But my husband and I both enjoyed! Thank you! There is now “Everything Seasoning” sold at Trader Joes, do you think that could be used as a shortcut for this recipe? Hi Stacy, I haven’t tried it so I can’t say whether the ratio of ingredients is the same as mine flavor-wise, but I’ve seen a bunch of people make my check in with the Trader Joe’s seasoning on Instagram and they seemed to like it! I don’t know that it would be a big time saver because it doesn’t take long to mix these ingredients together but if you already have some on hand it should work! I’m super pumped to try this. 🙂 IT. LOOKS. AMAZING! Thank you for the updated info, this looks delicious! Can’t wait to give it a try. I’m not sure what I did wrong but the cream cheese oozed out everywhere it was still really tasty though! A little too long in the oven maybe? Just wondering what the freestyle point value would be for this recipe? Sorry! I just saw that it is 5 freestyle points! Stacy, I used the Trader Joe’s Everything Seasoning last night to save time and it was delicious! Has anyone stuffed and coated the chicken a day or two beforehand? I want to prep it so it is ready to go! Just started weight watchers and I feel like I’ve hit a gold mine! I was so excited to try this for dinner tonight and it did not disappoint! Emily – this is delicious! I’ve been following and making your recipes for years and honestly haven’t found one I don’t LOVE. This is a favorite. So flavorful and we added a side of broccoli, cauliflower, garlic and lemon tonight. Thank you for this and all the meals you share!! I prepared this recipe tonight for my husband and me. It was so good. I served it with a small salad and some veggie tots. Thank you so much for sharing your recipes. I have pinned several more and I can’t wait to try them! Hey Emily so excited to try this one! Your website is one of my go-tos and I’m so thankful for what you do! Curious to know what you usually pair this chicken with? This is my absolute most favorite recipe I have tried to date! SOOOOO good!!! You rock, Emily!